General Partitions Manufacturing Company is based in Erie, Pennsylvania and has been providing quality products and services for over fifty years. All of the partitions are US made shipped from their Pennsylvania or Alabama locations. General Partition bathroom stalls are available in seven different material choices and a wide variety of color options. General Partitions prides itself on quality and as such has a special type of carton designed to protect partition shipments during shipping. An ultra express quick ship option is available on powder coated steel and solid plastic partitions. This will allow your order to ship in two working days and at no up charge. 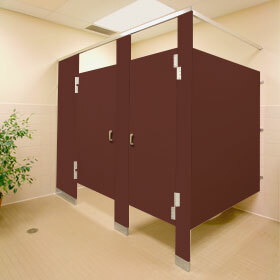 Powder Coated Steel Toilet Partitions – These bathroom stalls are both economical and durable. They have an exclusive use of galvanized-bonderized steel to provide additional protection. The material has a superior quality powder coated hybrid epoxy, an anti graffiti option, and double reinforced corners to provide additional strength. The finish is a superior quality powder coated Hybrid Epoxy – polyester applied electrostatically and baked until fully cured. This material is available in Overhead Braced, Floor Mounted, Floor to Ceiling, and Ceiling Hung mounting. Stainless Steel Toilet Partitions – General Partitions polishes their stainless steel to a satin finish giving it a beautiful appearance. This material is available with a deep textured surface, leather pattern, or diamond pattern. It is vandal resistant and easily fights against fingerprints and smudges. This material is shipped with a PVC film to protect the finish and it is removed after installation. These toilet stalls are available in Overhead Braced, Floor Mounted, Floor to Ceiling, and Ceiling Hung mounting. As an added benefit they comes with a 15-year guarantee. HDPE Toilet Partitions – The HDPE stalls are somposed of 1” solid high-density polymer resin that provides color throughout the material which offers additional strength and durability by using 8” wrap around hinges. Class B fire rating available in this material type and it includes a 15-year guarantee. Mounting options are available in Overhead Braced, Floor to Ceiling, and Ceiling Hung mounting. High Pressure Laminate Toilet Partitions –These restroom panels are available in a huge selection of colors and designs that offer a very economical and highly durable surface. While it’s standard core is particleboard and not recommended for high moisture areas, General Partitions plastic laminate meet or exceeds NEMA standards. These restroom stalls are available in Overhead Braced, Floor Mounted, Floor to Ceiling, and Ceiling Hung mounting. Solid Phenolic Core Toilet Partitions – These panels are available in a large selection of colors and patterns. They feature a black core and they will not delaminate because they form a one piece panel. They are completely water resistant, can be cleaned with basic soap and detergents, and they will not mildew. Each partition comes with a 15-year guarantee. All panels are available in Overhead Braced, Floor Mounted, Floor to Ceiling, and Ceiling Hung mounting. Color-Thru Phenolic Toilet Partitions – Color-Thru Phenolic offers the strength and durability of black core but with the appeal of a color throughout the entire panel piece. This material is a class A fire rated material and perfect for high traffic areas. Mounting options include Overhead Braced, Floor Mounted, Floor to Ceiling, and Ceiling Hung mounting. Fiberglass Reinforced Plastic – A rich resin surface makes this material highly durable and easy to clean. The material is bonded to a solid 90% wood substrate core and includes a Fiberglass Reinforced Plastic that gives maximum sanitation productions that meets USDA standards. This material will not rust, corrode, dent, or delaminate. It is available in five popular color choices and comes with a guarantee for 15 years. General Partitions also offers showerstalls and dressing compartments that are available in powder coated steel, stainless steel, solid phenolic core and solid plastic. These materials are great for school shower and locker rooms and dormitories because of the durability of the material. Colleges and schools will find the economic value and durability make it the choice for their locker and shower rooms. Shower stalls and dressing compartments are available in the same colors as the bathroom stalls. Replacement parts and hardware are also readily available and in stock to ship quick. Eastern Style partitions are available for areas where you need increased privacy. Panels and doors are 67” high and mounted just 3 ½” off the floor. For even more privacy, General Partitions offers Eastern Max Style where panels and doors are 72” high and mounted just 3 ½” off the floor. Continuous brackets and no sight door options minimize sight gaps. Toilet partitions are LEED certified. Each General Partition material carries LEED Credits based on the material properties.